GaryMoller.com - Health, Fitness - Naturally! : The Treatment was a Success; However the Patient Died! The Treatment was a Success; However the Patient Died! Well, not quite; but if the treatment continues its current course, death may well be the outcome. 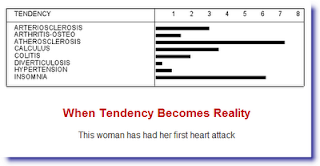 Here are the results of a Hair Tissue Mineral Analysis (HTMA) of a woman in her 60's who suffered a heart attack a couple of years ago. (Click on an image to enlarge). After successful emergency care she was placed on the usual dugs combination of a statin, beta blocker and diuretics. Lifestyle advice was next to nothing and nothing has been done to date to identify the dietary and lifestyle factors that may be the underlying causes of her ill health. 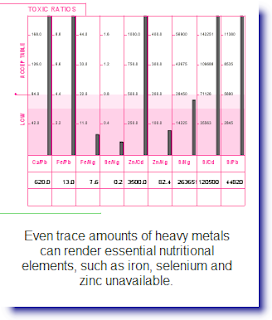 T his chart shows that her diet is lacking sufficient concentrations of most essential nutrients. This profile is typical of modern diets that tend to be high in a few nutrients like sodium (Na) and little of anything else. There is little truth in the advice one gets that one can get all the nutrients need by having a "balanced diet". Modern processed foods and even our vegetables are high in flavour and calories while lacking in jsut about everything else. When one scrutinises the end results of people on modern "healthy balanced diets" the results can be disturbing. Is the Hospital slowly Poisoning their Workers? This woman appears to be suffering boron poisoning. She works as a cleaner at the public hospital where harsh borax-based cleaners are used. Despite all the protective gear, it appears that she is accumulating far too much boron. While I have taken the matter up with the Cleaners' Union, they have shown no real interest and have failed to act in any way to clean things up. Deeply disappointing if you ask me. While these are all within the "Reference" range, one can see the risks that come with eating large fish like tuna nowadays and from cooking in aluminium cookware. 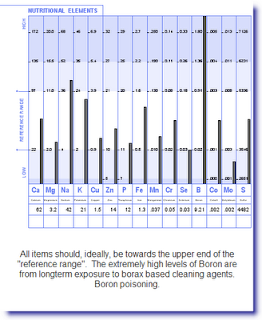 Tests for toxic metals can be misleading if there is not an understanding of how elements like mercury and lead interact within the b ody with other elements. While there may be little risk of direct damage to the body by traces of a toxic element, harm may still be done if other essential elements are in short supply. Even the smallest traces of a toxic element can have catastrohic effects. What we can see here is that the mercury has effectively rendered unavailable what little iron, selenium, zinc and sulphur she has in her body. She is being rendered anaemic, open to infection and has lost protection from oxidative damage that one normally has from trace elements like selenium. Sure, we can medicate this woman to suppress the symptoms (Atherosclerosis (cardiovascular disease) is really a symptom, rather than a disease. But this approach is doomed to fail as one can easily gather from reading the HTMA results. To properly deal with her ill healt h we must burrow deeper to identify and then correct the underlying causes. In this case, we can see the fultility of medicating longterm with heart drugs. We must eliminate her exposure to boron, get her on a nutrient dense diet, pump in some supplements (Such as Coenzyme Q-10, iron and B12). The statins must be stopped no matter what since they are destroying her muscles and brain and the other drugs can be easily replaced with natural substances that do the same job, such as natural vitamin E, garlic oil and vitamin C.
Note: A reliable Hair Tissue Mineral Analysis can be obtained through me. Just send me your name and address to 15 Heaton Terrace or email to gary@garymoller.com and I will send you a Hair Sample Kit which you then send for analysis. The fee is presently $225 (NZ$). This fee includes 30 minutes consultation with me to review your results. Your HTMA report usally takes 3-4 weeks to be completed. someone I knew told me they had done some research on the weed killer used by wellington city council. the council prefered their staff not to use either because they didnt want to unduly scare the public. ask the hard questions of the people in power, what are they doing or not doing to safeguard you from unecessary exposure to highly toxic substances. Tune ashould be banned from human consumption, it can contain 60 times the mercury that most other fish have in them, it can contain seven million times the amount of mercury in seawater, as mercury continues to increase in the seawater from burning fossil fuels, so large fish multiply the amount of mercury in their bodies. in the future expct more neurological problems from increasing levels of highly toxic substances like mercury. its worth researching what you eat and what chemicals you come into contact with, it could save you from alot of problems down the track. life is a minefield, if you investigate where the mines are your life will be far far safer.